Author of over 50 books of romantic fiction, many also published internationally, Rona Randall came to live in Radcliffe in 1940 and stayed for twelve years. It was during this time that she had her first widespread success as an author, writing many of her early books whilst resident in the village. Her Maiden name was GREEN, but she wrote her books under the pen name Rona Randall (RANDALL being her mother’s maiden name). She also wrote one novel, The Silver Cord, under her married name of Rona Shambrook, and one under the pseudonym of Virginia Standage (Golden Rebel (1981)). She began publishing in 1942 – whilst living in Radcliffe – writing mainly doctor/nurse romances, before turning to gothic romances. She also wrote historical romances. Possibly taking inspiration from the place names around her in Nottinghamshire, a 1946 novel is entitled The Howards of Saxondale. Her first novel The Moon Returns was published by Collins in 1942. “It is a novel full of promise”, wrote The Nottinghamshire Guardian (8th May 1942) “in which the writer shows herself possessed of imagination, sympathy and human understanding, and considerable powers of story-telling”. So impressed with this debut were the publishers (stated The Nottingham Evening News 14th May 1942) “that they have already taken up an option on her next two novels, one of which she has already written”. 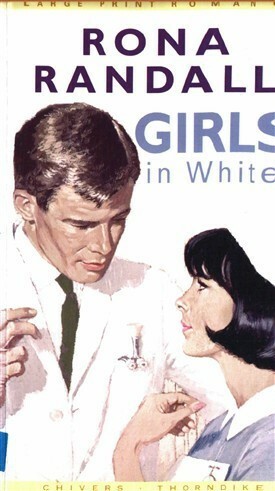 By the late 1940s, her publishers – Collins - were receiving (and publishing) two or three Rona Randall novels a year, illustrating the popularity of her writing at this time. Before their publication in novel form, all of Rona’s books of this period were serialised in American and Canadian magazines, and in 1948 this led to an invitation from her American publishing agents to visit the United States. 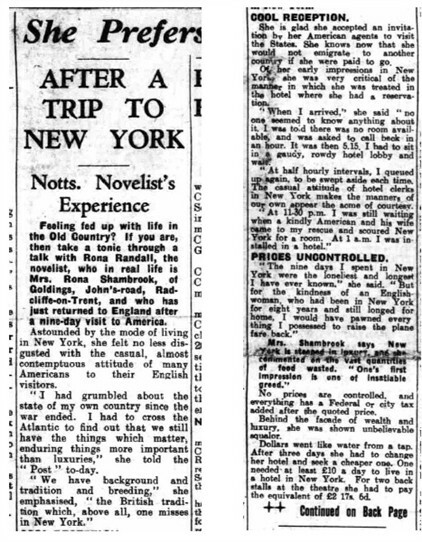 She spent nine days in the States, and upon her return, gave an interview to The Nottingham Evening Post (10th May 1948, p1 and p4). The text of this article is reproduced at the foot of this page. By 1958 Rona was publishing her 18th novel – The Merry Andrews – telling the story of the impact made by a film unit on a small country town. In 1970 her novel Broken Tapestry – a contemporary novel about a broken family - won the Romantic Novel of the Year award, awarded by the Romantic Novelists’ Association. Curiously, and most appropriately, the usual acronym for this association is ‘RoNA’. In the realm of non-fiction she was the author of Jordan and the Holy Land (1968), The Model Wife: Nineteenth Century Style (1989), and a complete guide for budding writers entitled Writing Popular Fiction in 1992. She also wrote articles on her favourite hobby, antique collecting. Rona Randall was born Rona GREEN on 16th June 1911 at Birkenhead in Cheshire. Her birth is registered there in the September quarter of 1911 (Vol.8a p.983). Rona’s mother’s maiden name is given as Randall, and this was the pen name she was later to choose when breaking into the world of fiction writing. She is recorded as having attended the Birkenhead School of Art, Pitman’s College in London, and as having received a Diploma in English Literature from the Royal Society of Art. Before turning to writing she also worked as an actress, a journalist with the Daily Sketch for 4 years, and as a sub-editor with the publishing company Amalgamated Press on the staff of the “Woman’s Journal”. She also became an assistant editor with the publishing house of George Newnes Ltd. In 1938 at Epping (December quarter vol.4a p.894) Rona Green married Frederick Walter SHAMBROOK, a Quantity Surveyor. A year later they are recorded as living at Chigwell in Essex, although by 1940 they had obviously moved to Nottinghamshire as the birth of their son, Paul, was registered at BINGHAM. She came to Nottinghamshire with her husband’s work as a surveyor in Nottingham. In 1948, when Rona travelled to New York on the Queen Mary, she gave her address as “Goldings”, Johns Road, RADCLIFFE-on-TRENT. This house is today No.27 Johns Road. By 1963 phone books list her at 10 Browning Mews, London W1. At the time of her research trip to Jordan in 1968 her address is given as East Lymden, Ticehurst, Sussex. A later phone book (1978) lists Rona and Frederick at “Walnut House”, Ticehurst, Tunbridge Wells in Kent, whilst the 2002 electoral roll lists then at “The Conifers” Pensbury Road in Tunbridge. This page was added by Website Administrator on 15/10/2018.